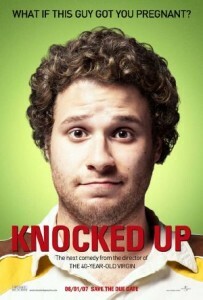 A very funny movie about a stoner who gets a beautiful girl pregnant and has to deal with the ramifications. This movie is terrific for two main reasons. the humor and the characters. it’s the story of a total slacker who ends up meeting a knockout girl at a club one night, getting her pregnant, and then having to change his life in order to support her. that sounds like a very cliched premise, and in other hands, this movie would be routine. but here, we get a movie that takes the time to develop the characters and introduce us to some very funny lifestyles before the two romantic leads even meet. this movie really does a nice job of bringing us into two very different worlds and making the side characters just as funny as the main ones. there are moments in the second half where the film does start to drag, but there is so much humor around every corner that the movie quickly recovers and gets back on track. Knocked Up is the best judd apatow directed movie. it’s a close call between this and the 40 year old virgin, but Knocked Up wins out in the competition. that’s because this movie pretty much has everything. it’s seth rogen’s breakthrough film as a leading man (40 year old virgin was his first real movie), and he demonstrates amazing comedic timing and personality. the same year that this movie came out (the same summer even), superbad was made, which rogen wrote as well as costarred in. and just like that, his career was off and running. the movie is about a burnout bachelor who lives with his friends, doesn’t work, and basically just smokes weed every day. this is ben stone (rogen). one night he goes to a club with his friends and meets a beautiful woman, alison (Katherine heigl, also in her breakthrough film.) alison works for e! news and just got a promotion at work that will now put her in front of the camera as a news interviewer, (whereas she was a producer behind the scenes before.) she and ben hit it off and end up back at her place, sleeping together. the movie takes its time with all of this. in fact, it takes its time introducing the characters before they even meet at the club. we spend scenes with ben and his friends learning about their lives and what they do for a job, (they are trying to start up a web site that tells you how long into a movie your favorite stars get naked), and we also spend a good amount of time with alison. in this story, we see alison at work, pampering stars like ryan seacrest, and getting promoted. she has two great scenes with the higher ups who want to put her in front of the camera, played by kristin wiig and alan tudyk. this is one of wiig’s early roles, and she is fantasticly awkward. we also spend time with alison at her home, which is attached to the much bigger house of her sister, debbie (leslie mann.) We not only meet debbie, but also her husband, pete (paul rudd), and their two kids. now this might all seem like a lot, but it’s not because every scene has its own comedic touches that add to the atmosphere. basically, every scene is funny in a different way. nothing feels tacked on, and in fact, each character is someone we would love to spend even more time with. case in point: there is now a movie out called this is forty, which is a spinoff of this film, and is just about pete and debbie. that’s how rich these characters are. even the scene at the club is handled with delicate prescision so that we can see how someone like ben might end up at the home of alison, in bed with her. we see ben in conversation with his friends before going to the bar, discussing the film munich. then we see him at the bar, dealing with one of those bartenders whose attention you just can’t get. that’s when he meets alison and gets a moment to look cool in front of her. but it’s not over yet. he goes back to his friends, works out a plan, and decides to go up to alison and her sister and start talking. the more detailed the club sequence is, the more believable it becomes. and ben’s friend, jason segal is his wingman, adding to the humor level whenever possible. ben and alison spend the night together and then they go out to breakfast the next morning. that’s when alison learns who this guy really is and what a burnout she just slept with. this is a very funny scene where ben is not trying to impress her at all anymore. he already got what he was after, and now doesn’t seem to care. that makes him extremely candid about his life, and how he doesn’t pay taxes, doesn’t work, and doesn’t even have a phone. by the end of the meal, alison has pretty much decided to never see this man again, and with good reason. but then the movie jumps ahead eight weeks to alison at work, where she realizes (thanks to some help from editor bill hader), that she is pregnant. she and debbie run to the pharmacy, grab some pregnancy tests, and get to work. the next thing you know, she is emailing ben, and getting in touch with him, trying to meet up to talk about their situation. the scene where she tells him is another great one, with his initial reaction being to tell her off. it isn’t long before ben realizes that he has the chance to be a good guy here. on the one hand, having a baby and being a dad will change his life and make him have to give up everything he loves. on the other hand, he has this chance to be with a girl who is way out of his league, and to start living the life of an adult, which he was going to need to do soon anyway, since his money from getting run over when he was a kid, is almost gone. there isn’t any scene where ben discusses this situation with anyone and weighs the pros and the cons, and its a shame, becuase the movie would have benefited from it. but this film is much more bent on comedy than it is on serious moments, and so a scene like that is easily sacrificed. instead, we get scenes that are funny, but also unnecessary, such as ben and pete taking a road trip to vegas or even a subplot where debbie thinks pete is cheating on her and drags alison and ben to come along and try to catch him in the act. these moments are fun, and they are nice additions to the story, but it is also pretty clear that they aren’t that important to the story either. this movie doesn’t care. if the scenes are funny, then they stay in the movie. that’s pretty much the policy with this one, and it’s not such a bad idea. the movie does start to drag a little in its second half. that’s because as it gets more serious and more about the relationship, then about the friends, it also gets less funny. the best thing about this movie is that is has whole worlds of different characters, and tons of hilarious actors in great roles. ben’s friends and roomates, for example, include jonah hill, jason segal, and jay baruchel. even james franco, craig robinson, and steve carrell make appearances. and i love how much time we get to spend with pete and debbie. the movie is consistenly smart and funny the whole way through, and even when it starts to slow down a little, it isn’t long before the stakes are raised and the story speeds right back up again. Knocked Up is a very funny and smart movie. the story isn’t anything totally unique or creative (it basically has the structure of a romantic comedy), but the humor level and characters knock it out of the park.